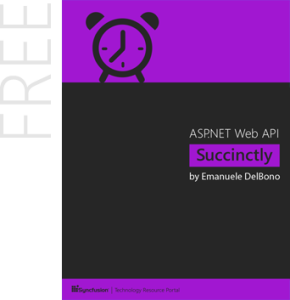 In the past week, my friend Emanuele Del Bono (Ema for all people who know him) announced his first tech book about ASP.NET Web API. 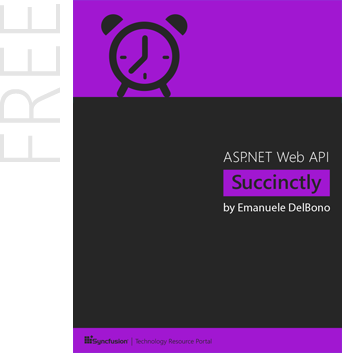 Who follow me knows that I’m a HTTP addicted, so I love everything around web development, starting from websites but also including APIs, especially if developed using WEB API (I wrote several posts about that framework). Syncfusion published the book in the usual (cool IMHO) format: a free, small e –book (it’s just 90 pages). Personally, I am not a fan of big books, especially if they are tech book. The reason is pretty simple: I don’t have so much time to read so, when I completed the chapter number 15 of a book with 800 pages, probably the arguments/frameworks of the book are already out of date. About the author I can’t spend so much words, Ema is a cooler and smart developer and he was a speaker when I participate for the first time to a conference as attendee (don’t remember the year, but was about localization in C# and he showed an application with “Bresciano”, strange Italian dialect :-)). If you need more detail, of course there are several cool blog posts around the web, but I suggest to keep in touch with that blog http://webapibloggers.com/ (is an aggregate of the cooler Web API Bloggers, included me :D). What’s next? Start read this super cool book downloading it from here.